Cerebral excrement: I won! I won! I always think it's funny when people say they've "won" something on ebay, as if they're getting it for free. Here's a print I "won" in one of the many auctions I bid on, in support of Haitian relief efforts (this one by Indie Fixx). 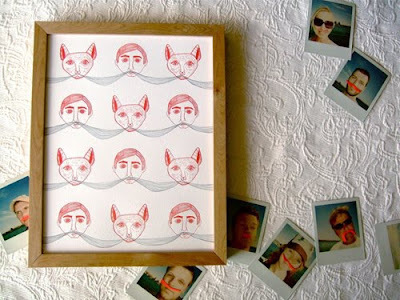 It's from Sycamore Street Press and features cats (and people) with moustaches. CATS with MOUSTACHES, people. It's printed with a letterpress printer, too. Of course, I am not a cat person, so I had it sent to Tanny and Matty in the USA. I am unsure if they are cat people either, but they are definitely MOUSTACHE and LETTERPRESS people. I love Sycamore Street Press. PS, they are giving away another letterpress print on their blog, of a ROBOT RIDING A BICYCLE. I cannot describe its awesomeness. Go enter. No, I am not earning commission. I am just grateful for everything I have (even my encounters with penile implants, without which I would be unemployed). A cat with a moustache - haha, truely a brilliant way to end my day. Thankyou.